This is a quick meal that can be made in the oven, on the grill or over a campfire. Divide green beans into 4 equal portions in center of tin foil. Drizzle with 1 tsp of the olive oil. And season with salt and pepper. Rinse salmon and season with salt and pepper. 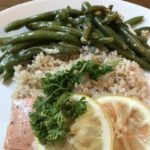 Place salmon over green beans. Drizzle olive oil. Top each with 2 sprigs dill and 2 lemon slices. Wrap sides of tin foil to create a packet. Place foil pouches in a single layer on a baking sheet or place on grill. Bake in preheated oven until salmon is cooked through, about 25 - 30 minutes.